Still, few could have anticipated just how gratuitously the Tax Cuts and Jobs Act violates the president’s promises to the American people. Pretending that corporate tax cuts produce huge wage gains for middle-class workers is one thing. But ending deductions that benefit veterans, indebted students, orphans, and people who suffer from rare diseases — while preserving one that benefits owners of golf courses — requires almost superhuman chutzpah. At present, the tax code provides “conservation easements” to owners of land who agree to leave their property undeveloped. The point is to encourage the preservation of forests and farmland, for the public’s benefit. But owners of private golf resorts can also access this subsidy, by promising to “conserve” their fairways and putting greens in perpetuity. 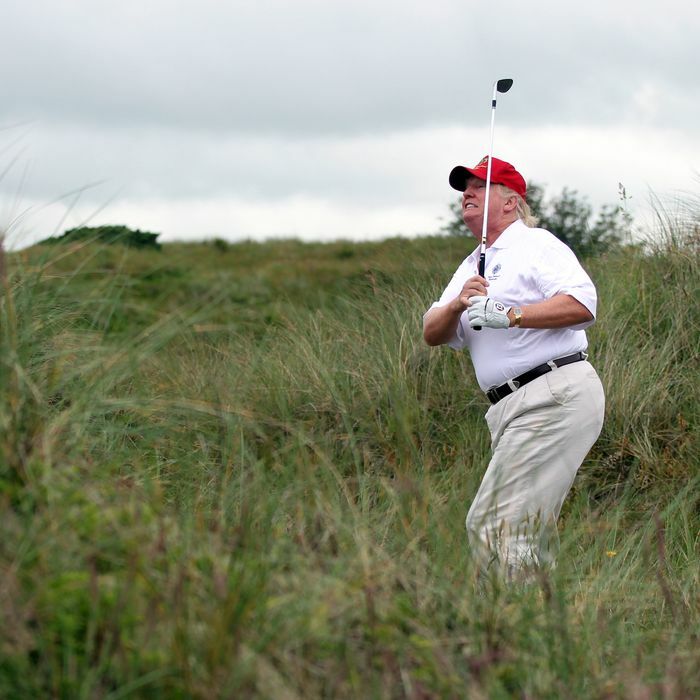 [I]n practice, the deductions that land owners take for golf courses are enormous compared with the conservation value, said Ruth Madrigal, a tax lawyer who worked on conservation easements for the U.S. Treasury department during the Obama administration. A developer can build homes and a nearby golf course, get a conservation easement on the links and claim a deduction that can pay for the entire development, she said. “The Obama administration wanted to cut the deduction because it viewed the policy’s costs in total as far exceeding the conservation benefits,” Madrigal said. The president has claimed this tax break for his “conservation” work at the Trump National Golf Club in Bedminster, New Jersey, and Mar-a-Lago Club in Palm Beach, Florida. The Obama administration estimated that ending the deduction would generate $600 million in revenue over ten years. The GOP’s unusual approach to closing “special interest” loopholes aids Trump in other ways. The Republican plan bars most businesses from deducting interest payments from their tax bills — but preserves that privilege for commercial real estate. Most egregiously, the bill appears to cap the state and local tax (SALT) deduction for upper-middle-class families, while maintaining it for business owners in high-tax states. On first brush, the rollback of the SALT deduction was the one part of the GOP plan that looked genuinely bad for Trump, who surely pays a decent amount of state and local tax on his New York properties. But it now looks like owners of pass-through businesses will be free to continue exploiting the deduction (even as those who work for a living lose out). During a Ways and Means Committee hearing on the tax bill this week, Democratic congressman Earl Blumenauer asked whether business owners would, in fact, retain the deduction. He said that the Joint Committee on Taxation — the entity responsible for scoring the Republican plan, and thus, determining whether it complies with budget rules — had suggested that business owners lose the deduction like everyone else. But when he’d broached the same subject with Republican congressional staffers, he was told the opposite. (1) While the Committee leadership knows that the answer is yes — the likes of Trump and the law firm partner can deduct their state and local income taxes under the bill, whereas employees can’t — it does not want this to be generally understood at present. So they are trying to stonewall. (2) The Committee leadership knows that the JCT revenue estimate is wrong because it didn’t account properly for the widespread “business owner” deductibility of state and local taxes. This could either have been an honest blunder amid the high-speed train wreck of the rapid-fire drafting, or it could have reflected diffidence about fully explaining things to the JCT — it doesn’t matter now. But if they know that the revenue estimate is wrong, and that it would be higher if done right, and that this is at risk of coming out, then they may feel they are trapped and have to push aggressively forward, in the hope of completing this stage of the process before their actions are exposed. … I don’t know that #2 is so, but stonewalling has a way of broadening one’s suspicions. It would also help to explain why they appear to be so set on stonewalling, when the bill’s substantive effect is bound to come out well before enactment anyway. This analysis has yet to be confirmed. On Wednesday, Brady defended his proposed elimination of the adoption tax credit, on the grounds that it disproportionately benefits families that don’t need it (the credit is inaccessible to households that make over $243,540 a year). Encouraging adoption is a worthy goal, Brady allowed, but not one that justified maintaining a mildly regressive tax benefit. Golf-course maintenance and commercial real-estate development, on the other hand, are so vital to our republic (in the GOP’s ostensible view), it’s worth maintaining massively regressive loopholes to encourage both.